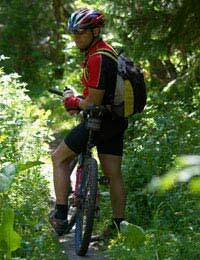 Like most sports, mountain biking requires the right type of clothing if you intend to become serious about it. Beginners often stick to their own clothing because they don't want to waste money, but this can be uncomfortable and even dangerous. This article looks at some of the best clothing for mountain biking. Although most people tend to think of cycle shorts as being solely from lycra, you can also find cycle shorts that are baggier. The main advantage of tight-fitting Lycra is the fact that it limits wind resistance and is often more comfortable than baggy clothing. For many mountain bike riders (and cyclists in general), this is the most important item of clothing to get right, as choosing the wrong pair of cycle shorts can make your whole ride uncomfortable. If you choose a good quality pair of cycle shorts, they can last for years. If conditions aren't suitable for cycle shorts, cycle trousers are an alternative option. Look for a pair that have movement around the knee so that they don't interfere with pedaling. Cycling jerseys tend to be made from tight-fitting lycra or synthetic material. Cycling jerseys rarely get as sweaty as t-shirts, which helps to retain warmth. They can be either long sleeved, sleeveless or short sleeved, depending on the conditions in which you will be mountain biking. Many cyclists wear cycle jerseys as part of a layering system. If you plan to be mountain biking after dark, this is an essential clothing item. Reflective cycling clothing ranges from reflective arm, leg bands to reflective jackets. Cycle gloves provide added comfort while cycling, especially on long rides when your hands can easily get sore from constantly gripping the handlebars. Look for gloves with added padding. If you don't mind spending a little bit extra, there are cycle gloves available that are filled with gel in the palm area for added comfort. These are designed to limit vibration, and provide an extra cushion for your palms if you fall off the bike. Full fingered cycle gloves are good for cross country mountain biking during the winter, although it's usually the palms of your hands that come off worst if you fall off the bike. These are a good idea if you have a tendency to fall off your bike as they cushion the legs and knees. Cycle socks should be tight-fitting, and be made from cotton or Gore-Tex (a waterproof material that allows the skin to breathe). If it's particularly cold or damp, you might want to wear a lighter pair underneath or over the top to retain heat. In this case, the inner pair should be thin cotton, and the outer pair should be Gore-Tex or slightly thicker cotton. You need to consider your bike pedals when choosing cycle shoes. They should be made from a combination of soft leather (on the upper part) and perforated plastic (on the soles) to allow sweat to easily leave your body. There should also be a cleat on the soles to grip the pedal and hold your feet in place while riding. This stops your foot from slipping when you push upwards or downwards on the pedal during climbs.